Note:The watches shown are for display purposes only and is not included with purchase. 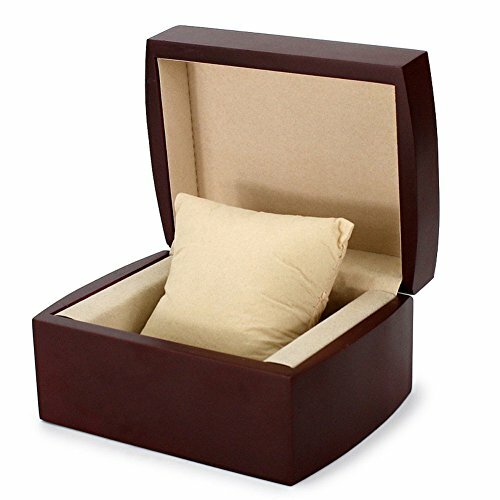 Perfect Watch Box for Storing Watch, Travel, Gift Packaging, Small pillow Included. Fashion luxury watch storage box with 1 grid. This watch box can be a fantastic storage item to store your collection of watches, jewelry, and other small trinkets while maintaining a distinct style and providing overall protection. Storage for 1 watch. Removable pillows provide extra protection for your collection and also can make room for other accessories. Watch stays secure by being wrapped around an ultra-soft cushion that fits most sizes and styles of watches, large and small, men's and women's. Perfect for home and business use,and a wonderful gift idea. Case Size: 12cm x 10cm x 7.5cm (4.7"x3.9"x2.9"). Pillow Size:3.5"x3.3"x2". Please take the time to measure your watches to see if they will fit in these slots. If you have any questions about this product by AVESON, contact us by completing and submitting the form below. If you are looking for a specif part number, please include it with your message.